An Bang Beach Village restaurant is designed for people who want to get off the Hoi An tourist track and experience the real Vietnam in the local villages. Why An Bang Beach Village Restaurant is special ? 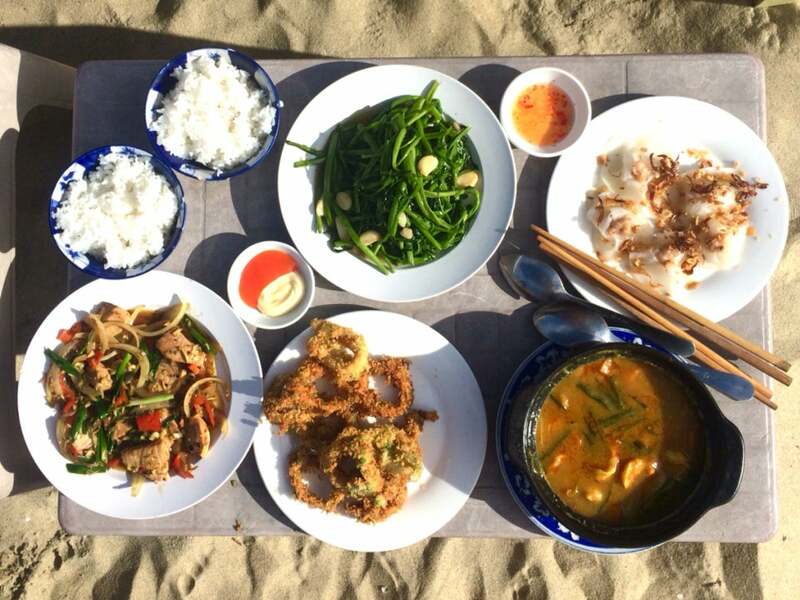 An Bang Beach Village restaurant is where to enjoy various dishes with unforgettable flavour. It takes more than exquisite cooking to make a memorable meal. Their menu changes according to the season and which fresh ingredients can be found at the daily market. Therefore, the food is prepared by their chefs with the use of fresh seafood selected from the fisherman’s net every day and the organic vegetables and herbs from our local village. They also provide two beautiful settings: the comfortable, home-like, family-run restaurant on an attractive, quiet alley not far from the beach, and a relaxing and scenic location on the beach where you can chill out under umbrellas while sipping on a cocktail or enjoying one of their freshly made dishes. And, of course, always with professional, friendly service. How to get to An Bang Beach Village Restaurant? An Bang Beach Village restaurant is located on Lac Long Quan Street, quite far from the centre of Hoi An Town. You can take a taxi to hire a motorbike to get there. For those of you who would prefer to be a traveler and not just a tourist, this is a unique opportunity to join the fishermen and for an hour or two and experience their life. An Bang Beach Village offers Bicycle Tour and Cooking Class for people who want to get off the Hoi An tourist track and experience the real Vietnam in our local villages. If you want to exceed expectations and “wow” your loved one, you can book the beautiful “Dinner on the Beach” package featuring a heavenly setting with flowers & candles on the beach. If you have a bike, ride directly to the village and avoid the "bycicle parking lot" where they charge you 10.000 dongs per bike. We visited An Bang Beach Village restaurant twice, as well as doing the morning cooking class. Each visit was a wonderful experience. We had lunch the first time, and the food was fantastic - amazing, fresh seafood. The cooking class was also really good fun and very thorough. Dong was a lovely host and his brother in law, the restaurant's chef and our teacher was so patient and very clear in his instruction and we loved the food we got to make, and eat! We enjoyed the experience so much that we decided to book for the special 'dinner on the beach' meal for our last night. Sadly the weather was against us, and despite Dong's best efforts, the heavy winds/rain on that one night meant this wasn't possible. However, we enjoyed this back at the restaurant just as much, and again the food and service was fantastic. Just of note is that I was a little unwell on this night (nothing to do with the restaurant), but I was a bit concerned as I was flying the next day. Dong and his family were brilliant and gave us great advice of what to do and took us to the local pharmacy and explained the issue to them, totally going above and beyond. There is such a lovely feel about the area of An Bang, and it was our favourite beach location. The beach village restaurant is a real gem here and we would highly recommend it. Thank you so much Dong and family for really enhancing our time in Vietnam.